The f-word has a provocative article (written by a man!) about the way gender stereotypes hurt men, why men tend to not fight them the way women through feminism have, and what we should do about it! ...From an early age, women are aware of their gender and what it means for their lives, far more than men are. Feminism encourages women to shed gender stereotypes and consider themselves as individuals. Men simply don't think about gender. Why would you, when it rarely impacts in a noticeable way on your life? Very rarely is your progress barred because you are a man and it is true that male culture generally does not promote frank and open discussion of such issues. 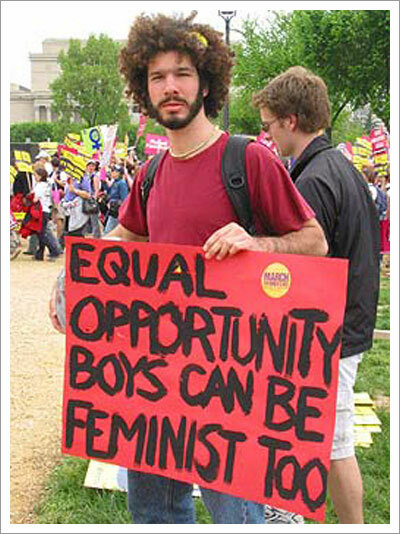 Many men aren't feminists simply because it has never occurred to them that they should be: when you're not faced every day with the challenges thrown up by gender inequality it is very easy to think: "Well, we've changed the law so we have equality now." In order to combat these stereotypes, gender analysis (feminism!) absolutely has to be embraced. This is not only to prove them false by demonstrating they do not accurately reflect the diversity of men's lives, but also to provide discursive analysis to understand how these stereotypes produce masculinity in particular ways: in much the same way that, for example, feminist analysis showed that the stereotype that women are not as good at math and science as men guided teachers and parents to steer girls away from those subjects at both school and home, after which few women would enter those fields, providing the empirical fact that women do not so well in math and science because few women in fact do work in those fields. What this example (and many others!) shows is that even if stereotypes do reflect a significant portion of a population, that does not make their manifestation "natural." It is important to look at how masculinities and femininities are produced as such. And as I allude to above, there is much analysis done already that looks at the sexism and homophobia that produces masculinity in particular ways. So if we want masculinities that are rich and varied, and if we want to combat homophobia and misogyny, men need to embrace gender analysis, feminism, and begin to critique these stereotypes on a regular basis in their daily lives the way feminism has been for decades.